Knowledge you trust. Experience you relate to. Guidance that enhances your quality of life. Home » News! Research! Updates! » Gimoti for Gastroparesis? This doesn’t happen very often, but today we get to talk about a (possible) new drug coming out of the pipeline to treat gastroparesis. I’ll give you the cliff notes up front: Don’t get your hopes up too much – this one isn’t all it’s cracked up to be. Gimoti is a nasal spray version of a very old drug, Reglan (metoclopramide). Most people that are diagnosed with gastroparesis are placed on Reglan for at least a little while to see if it helps, so many of you have probably already taken the tablet or liquid form of this drug. Why develop a new version? As many of us with gastroparesis already know, tablets have a habit of sitting in the delayed stomach for a very long time. So finding non-oral ways to take our medications is a big deal. Enter a nasal spray version of metoclopramide. 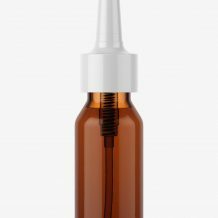 This nasal spray version seems to work about the same as the tablet version, which is the least that we should be able to expect. Personally, I would have liked to have seen some really phenomenal results when they compared the spray to the tablet. If we’re going to invest research time and dollars into a treatment for gastroparesis, it should be better than what we already have. Instead, they turned out to be about equally effective. One of the interesting things about Reglan is that we don’t actually have many good studies showing that it works well in gastroparesis. It’s a pretty old drug, and because we know that it speeds up the movement of the stomach in certain situations, it became a go-to gastroparesis treatment. Studying this new form of metoclopramide became an opportunity to see just how well it actually works. There are other shortcomings to our understanding of this drug. For one, pretty much all of the information that we do have on metoclopramide is in people with diabetes who developed gastroparesis. To add to that, we also don’t have very good information on how well it works in the long-term. Most of the studies out there didn’t last longer than 12 weeks, so we don’t know if it maintains any efficacy when it is used for an extended period of time. There are also safety concerns related to using metoclopramide for longer than 12 weeks, but I’ll get to that in a second. The first study with Gimoti (the new nasal spray version of metoclopramide), included 285 people: 190 people took the drug and 95 people took a placebo. The surprising news? The people receiving the drug didn’t do any better than the people receiving the placebo. Uh oh. So the researchers broke it down a little bit more and realized something quite unexpected – men were not responding to the drug at all, but women seemed to have a small response. In fact, men had a stronger response to the placebo than to the drug! That definitely casts some doubt on the findings of this study. From that point on, the researchers stopped studying the medication in men. But they did conduct a study to see how the body processes metoclopramide, and whether that process was different between genders. It turns out that it is. For some reason, the men in the study absorbed less of the drug, which made it much less effective for treating their symptoms. Women absorbed more of it, which allowed it to work more often. And yet, when they performed another study that only included women, they still didn’t get the results that they were looking for. In this study, 102 women received the drug, and 102 women received placebo. And they found exactly what they found before – the drug was not more effective than the placebo. The only people who seemed to experience any benefit from the drug (compared to the placebo) were people with moderate to severe gastroparesis. This means that the people with the worst symptoms experienced a slightly larger improvement in their symptoms when they took the drug in comparison to those taking the placebo. It looks like it might, but if I’m being completely honest, it doesn’t work very well. They had to narrow down the people that were taking this drug into smaller and smaller categories in order to even find anyone that benefited at all! And even when they limited it to women with moderate to severe symptoms, the improvements were not very impressive. Unfortunately, the drug company did not run the studies for long enough for anyone to answer that question. But I can tell you that we know for a fact that metoclopramide can be dangerous when it is taken for longer than 12 weeks. Metoclopramide has been associated with a permanent disorder called tardive dyskinesia. I won’t explain it much here – other sources have already done that – but this is a debilitating condition that can be permanent once it shows up. And the risk of developing this condition goes up dramatically when metoclopramide is taken for more than 12 weeks. There are other, non-permanent side effects from metoclopramide as well. These include things like tremors and involuntary movements. These can go away within a month or two of discontinuing metoclopramide, but they can be frightening and uncomfortable to experience. And the most common side effects with this medication are restlessness, drowsiness, and fatigue. My final word on Gimoti – I would hesitate to recommend it to anyone. And I will be surprised if it is approved by the FDA. We need more treatments for gastroparesis, but unfortunately this one doesn’t give us anything new to work with. If anything, the excitement surrounding a “new option” might set us back further from finding a truly effective treatment. As a new medication, it will be very expensive, and studies have failed to show that it is much more effective than the tablet or liquid forms of the medication, which are quite cheap. In addition, it will only be approved for women with diabetic gastroparesis, which means that women without diabetes will be unlikely to have it covered by insurance. And finally, considering that gastroparesis is a chronic condition, I am hesitant to recommend a medication that can only be used in the short-term to treat symptoms that will be around for a long time. Any person that sees a benefit from metoclopramide must make a very difficult decision after 3 months about whether or not it is helpful enough to outweigh the possible risks of continuing to use it. Looking to learn more about managing gastroparesis? Check out these articles. Information just like this can leap right into your inbox! Sign up to have all new material shot directly to you (no more than once a week). You'll never miss a thing. Success! I'm so excited that you've joined us! Your information will never be shared, sold, or used for any other evil purposes. What are the Symptoms of Gastroparesis? What is a Gastroparesis-Friendly Diet? The knowledge and tips to get your health back on your terms. Delivered straight to you no more than once a week. You're subscribed, and I'm so excited to have you! The information found on this site is meant to enhance knowledge and understanding. No treatments or strategies should be altered based on the content of this site without consulting a physician that is directly involved in your care. Copyright 2018 © YourGIJourney All rights reserved.